Thirsty Pilgrim: Fantasizing About Exercise Makes Us Thirsty for Bink. Fantasizing About Exercise Makes Us Thirsty for Bink. Mrs. Pilgrim and I own no bicycles, but we occasionally imagine it. Usually this happens only after we've driven our car to a pleasant brewery or café attached to a cycling trail. In Limburg we've been to at least two places that had that effect on us: the Achel Trappist brewery on the Dutch border, and the Kerkom brewery in the pastoral Haspengouw region. On Saturday it was Kerkom. The brewery sits in an area near Sint-Truiden that offers a mix of trees, farmland and gentle hills—perfect for cycling (or so we gather). It's on a road that's part of several cycling routes, including the Trudo "Local Beers" Route. Four euros gets you a map from the tourist office in Sint-Truiden. You can also rent bikes there for €9 a day. 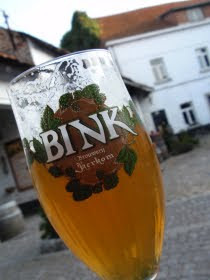 Bink is the beer and the nickname for the locals. The beers are all worth trying but geeks will want to ask about the rare Bink de Reuss, a tart and refreshing blend of blonde ale and Girardin lambic. Specialist cafés and the odd festival are your best bet for that one. We went with the Bink Blond, the noble-hoppy classic, quaffable at 5.5% strength—a nice one to convert lager lovers to ale. Thirst-quenching. Just thing after a long, um, drive. The fine print: From April to October, Kerkom's café is closed Mondays and Tuesdays, open other weekdays starting at noon, and weekends and holidays starting at 10 a.m. During the cooler months it's only open Thursdays though Sundays starting at noon. 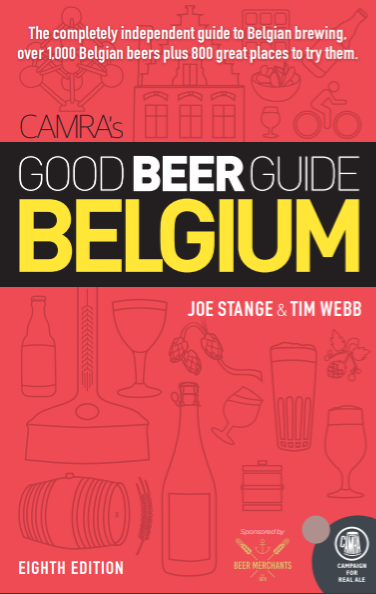 For hundreds of other excellent Belgian road trip destinations, invest in the Good Beer Guide Belgium by Tim Webb, a man who owns a bicycle and uses it here as often as possible. The 'S' on His Chest Stands for Saison. New 'Hoppy Loft' Opens at Delirium. Forty Handles and a Mule. All the Rest of You are Slackers. I've Been Saving Up for You.